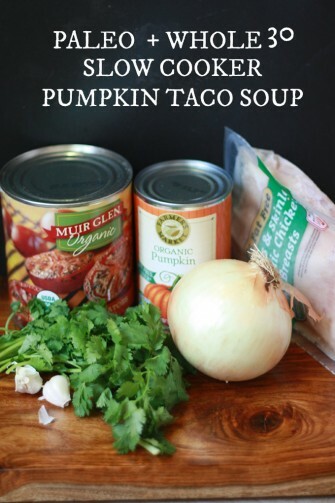 Slow Cooker Pumpkin Taco Soup – This is the BEST taco soup. We make it year round. It’s loaded with flavor and nutrients. And it doesn’t get easier than a slow cooker! 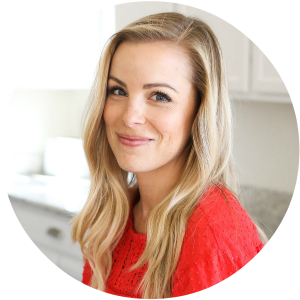 I’m so excited to finally get to share this recipe with you! I’ve had it ready for weeks, but things kept popping up and it kept getting bumped back in the queue. It’s amazing. This Pumpkin Taco Soup was so good that Milo (my not-yet two-year-old) asked for another bowl of soup over a birthday cupcake. For real. We’ve made it twice in the last few weeks (once to freeze), and it’s come out so great! 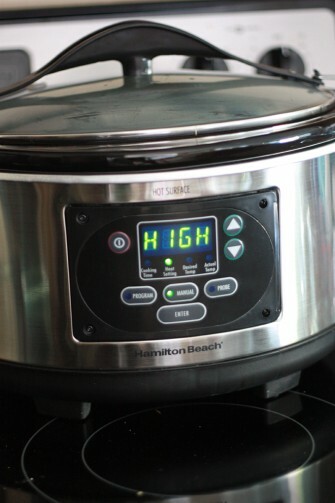 It’s a cinch to throw together, and with the programmable options of the slow cooker, you can keep it warm all day long as soon as it’s finished. It’ll just get better with time! In case you’re a bit nervous about pumpkin in your savory soup, it’s not a predominant flavor here. The pumpkin adds a great silkiness, beautiful color, and a heaping dose of vitamins to the soup. 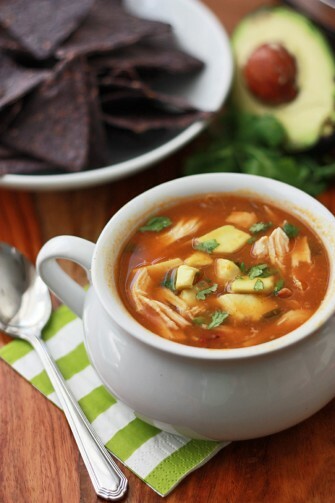 The other seasonings work together to give it just the taco soup flavor you’re looking for, with plenty of punch for the adults, but not too strong for little eaters. I think it’s just right. The broth is really incredible. I think it just gets such a great flavor, and fills you right up in your happy place. An extra dose of protein from that delicious, tender chicken, and you’ve got something special. It would also make a great quick dinner for Halloween–something light but substantial and NOT sugar-filled to fuel you up for the evening. It’s the best! My kids prefer smooth soups. My kids like when I pull out the chicken, puree some of the soup, then serve the chicken on the side or stir it back in. Milo loves chicken, but prefers smooth soup, so this way he eats both parts. You can also use this trick if you prefer your soup on the thicker side. Puree up to half of the soup, then stir it into the rest of the soup. I’ve shared this a lot, but we swear by Asian soup spoons. They’re flat and easier to slurp from, which is perfect for little ones just learning the motion of eating soup from a spoon. I actually use them myself–I spill less! I don’t dice up my chicken here, since I like to shred it right into the soup. You can dice it if you like, but know that it’ll cook a little quicker. 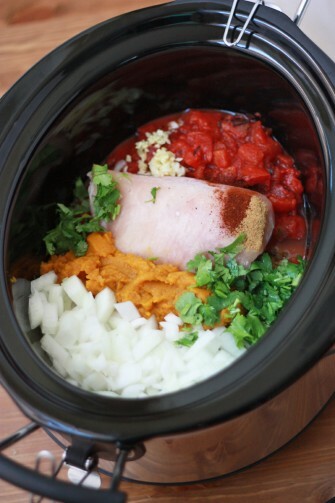 Place everything in the slow cooker and stir to combine. Cover and cook on HIGH for 3-4 hours or LOW for 7-8 hours. Shred the chicken into the soup and serve with extra cilantro to garnish. Simple and healthy. My kind of meal! Have this in my crock pot today. Was supposed to be for dinner but I broke down and ate 2 bowls for lunch. Loved it! Thanks. Hi, Emily: I’m making your soup right now. The smells are incredible. Cannot wait for it to be done. I must say I was hesitant about the pumpkin, since it’s not my favorite flavor. But, oh my! It adds such a nice texture and the spices hide the taste. Thanks so much for posting, and have a great week. LOVED THIS! So simple, so easy, but so much flavor! Doesn’t taste pumpkin-y, just delicious! And my 3 year old loved it too! I plan to make this tomorrow (oh how I love bonus-day weekends!) and was thinking about adding rice or chopped butternut squash to this. Do you think either option would work with this recipe? The rave reviews make me hesitant to mess with it!! I love it as is, but you could probably get away with chopped butternut squash, if you wanted to try it! I think rice would get over cooked unless you added it much later in the cooking process. I’d love to know what you think if you add the squash! I made this with the squash on Monday with mixed results. I set it for 8 hours on low, and the squash ended up overly soft, and added extra moisture to the soup that seemed to water down the flavor (but nothing some extra spices couldn’t fix!). Next time, I’ll add the squash in the final few hours. One of our new favorites! So incredibly easy, but so yummy! Our whole family loves it! For my non-meat eating husband, I have done black beans instead of chicken and he loves it too. We love it with avocado and crushed tortilla chips on top. After the hiccup with the butter chicken, I made this yesterday. I was tickled that I only had to buy two things to get it going! This is the first time I’ve had pumpkin in a savory food, and I totally agree that it doesn’t lend much flavor (except in deliciously pumpkiny burps) even while it adds a lot of weight to the broth. I served it over brown rice (I put anything with a thicker broth on rice), and it was so filling and satisfying! My boyfriend really liked it. It has a very clean, fresh taste. Very light and definitely satisfying. One batch made some decent leftovers that’ll hopefully keep us going through at least some of the week. Thanks so much for the recipe! You are so welcome! Enjoy those leftovers! 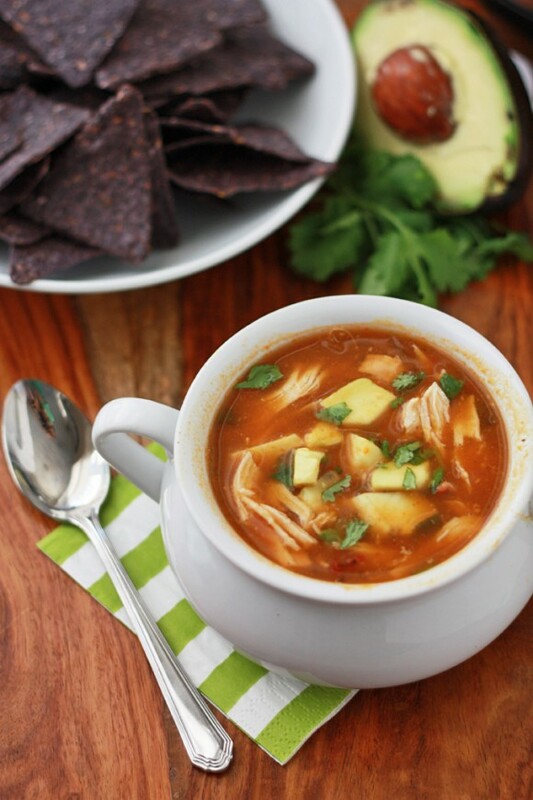 Have you tried making this soup on the stove instead of the crock pot? Betsy – Yes, though I typically do it with cooked chicken when I make it on the stovetop. Saute the onion, add the spices, then stir in the rest of the ingredients. Simmer till everything is tender and delicious! I made this for dinner tonight and it was a huge hit with my whole family, all the kids included! Thanks so much for sharing. Have you made it without chicken? It works just fine without chicken! You may want to add an extra cup or two of veggies, so that it doesn’t feel to broth-y, but if you like plenty of broth, you don’t need to change a thing. Ooh, that bread sounds amazing! I hope you love the soup! How would you spice this if you don’t have fire roasted tomatoes ? You can absolutely use regular diced tomatoes. The fire-roasted ones just have a slight smoky taste. You could add a pinch of something like smoked paprika, but there are no extra spices in fire-roasted tomatoes. Hope that helps! This was so good! I will be making it again. Oh, I’m SO GLAD you loved it!! !